Not that any of us had any doubt about this happening, but it's official: Mother Teresa will be sainted by Pope Francis! The canonization is expected to occur in 2016, and many predict it will be early in the month of September, as that is when her Feast Day occurs. 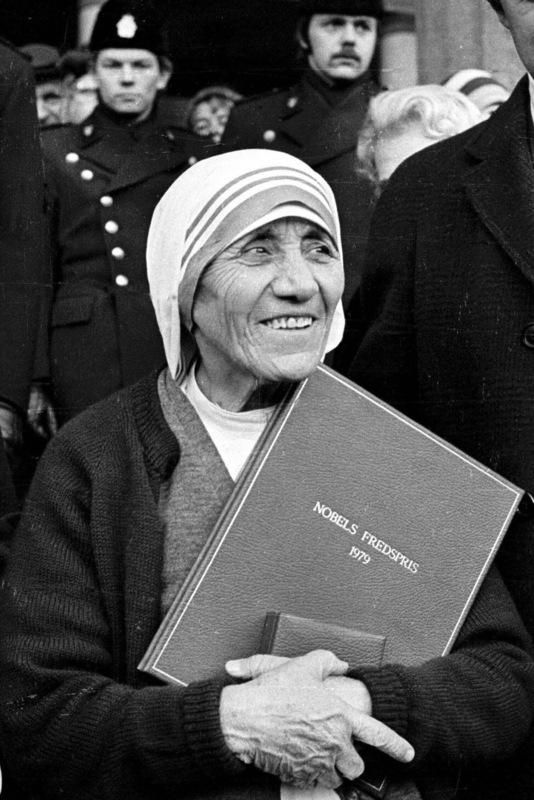 Now, you may very well be thinking: Wasn't Mother Teresa already a saint? No? Well she's dead, so what did she do to become a saint now? Unsurprisingly, the process to becoming a Saint is no simple feat. But let's start with some basics on who Mother Teresa actually was and then get into the actual canonization process. Born Agnes Gonxha Bojaxhiu, she grew up in Skopje. At eighteen, she joined the Loreto Sisters of Dublin mission, moved to Ireland, and chose the name Teresa (after the saints Teresa of Avila and Therese of Lisieux, both of whom are pretty cool themselves). Then, she was a teacher in a Catholic school from 1931 to 1948. Of course, people don't become Saints just because they're teachers (though teachers sometimes have the patience of saints). So, Mother Teresa went to Calcutta, India where she taught the poorest of the poor, as well as setting up hospices, helping orphans, and caring for the sick. All of this earned her the nickname "saint of the gutter." Eventually, her humanitarian work there caught people's attention, and she ended up winning the Noble Peace Prize in 1979. Mother Teresa continued working up until her death in 1997; she was 87 years old at the time. Then, she was beatified in 2003. Beatification is the first step to becoming a saint. Pope John Paul II beatified her when he acknowledged Mother Teresa as responsible for curing an Indian woman of her abdominal cancer, and called it a miracle. While the Vatican hasn't released a lot of details about the second miracle, supposedly she cured a Brazilian man with several brain tumors in 2008 after his priest prayed to her for his recovery. Pretty awesome lady, right? Saint Joan of Arc is definitely one of the most celebrated saints out there, and for good reason! An ordinary peasant girl living in medieval France, Joan was positive God wanted her to lead France into victory during their long-time feud with Britain. And, with zero military training, she led an entire army into battle, and won! Super cool, right? Unfortunately, Joan was captured shortly thereafter, tried for hearsay, and then burned at the stake...all at the age of 19. Saint Christina is often known as the patron saint of the mentally ill and the patron saint of therapists, and she has a really enthralling story. At the age of 21, she supposedly suffered seizures so severe she became catatonic, and was nearly buried. At her funeral mass, she woke up, and talked about meeting the Devil. After that, she did a lot of unusual this: She spent time alone in tombs, stood in freezing water for hours, and slept on rocks. Supposedly, during these episodes, she was leading the souls to purgatory, or from purgatory, to Heaven. The first American to be canonized by the Catholic Church! Total pioneer. She had a huge hand in establishing public schools in the United States. On her canonization, Pope Paul VI said, “Elizabeth Ann Seton is a saint. St. Elizabeth Ann Seton is an American. All of us say this with special joy, and with the intention of honoring the land and the nation from which she sprang forth as the first flower in the calendar of the saints. Elizabeth Ann Seton was wholly American! Rejoice for your glorious daughter. Be proud of her. And know how to preserve her fruitful heritage.” So, fellow Americans, be extra proud of her, the Pope says so! This story is really wild. Born pagan, Margaret converted to Catholicism as a young girl, and took a celibacy vow. A Roman governor insisted on marrying her anyway, and when she refused, he put her in prison. Not wild enough? Supposedly (we can all use our imagination here) while Margaret was being tortured, Satan appeared and swallowed her whole. Luckily for Margaret, she was wearing her cross, which she then used to cut him open from the inside, and escape.